What Is an Ankle Fracture? A fracture is a partial or complete break in a bone. 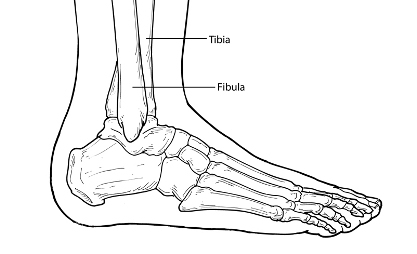 Fractures in the ankle can range from the less serious avulsion injuries (small pieces of bone that have been pulled off) to severe shattering-type breaks of the tibia, fibula, or both. Ankle fractures are common injuries that are most often caused by the ankle rolling inward or outward. Many people mistake an ankle fracture for an ankle sprain, but they are quite different and therefore require an accurate and early diagnosis. They sometimes occur simultaneously. Blisters may occur over the fracture site. These should be promptly treated by a foot and ankle surgeon. Bone protruding through the skin—a sign that immediate care is needed. Fractures that pierce the skin require immediate attention because they can lead to severe infection and prolonged recovery. Following an ankle injury it is important to have the ankle evaluated by a foot and ankle surgeon for proper diagnosis and treatment. If you are unable to do so right away, go to the emergency room and then follow up with a foot and ankle surgeon as soon as possible for a more thorough assessment. 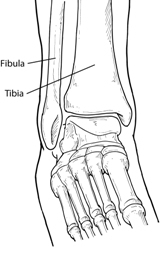 The affected limb will be examined by the foot and ankle surgeon by touching specific areas to evaluate the injury. In addition, the surgeon may order x-rays and other imaging studies, as necessary. Rest: Stay off the injured ankle. Walking may cause further injury. Elevation: The ankle should be raised slightly above the level of your heart to reduce swelling. Immobilization. Certain fractures are treated by protecting and restricting the ankle and foot in a cast or splint. This allows the bone to heal. Prescription medications. To help relieve the pain, the surgeon may prescribe pain medications or anti-inflammatory drugs. For some ankle fractures, surgery is needed to repair the fracture and other soft tissue related injuries, if present. The foot and ankle surgeon will select the procedure that is appropriate for your injury. It is important to follow your surgeon’s instructions after treatment. Failure to do so can lead to infection, deformity, arthritis, and chronic pain.